Former United Nations-Under-Secretary General for Political Affairs Jeffrey Feltman with TNA Leader Sampanthan during the discussions. 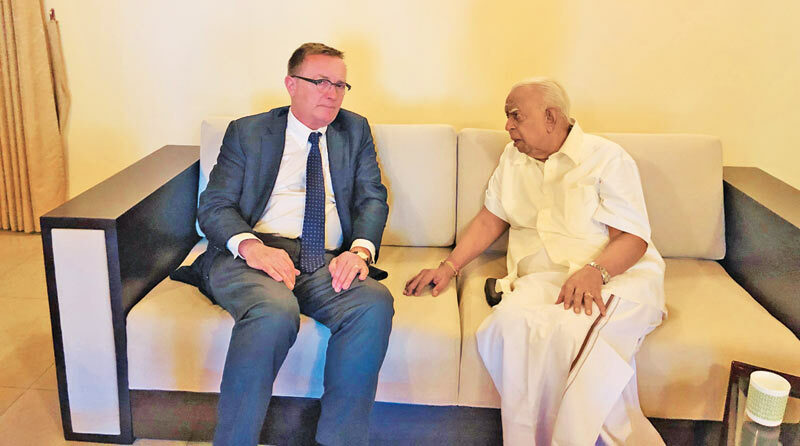 Former United Nations-Under-Secretary General for Political Affairs Jeffrey Feltman met with Tamil National Alliance(TNA) Leader Sampanthan in Colombo on Monday. Feltman commended the TNA and its leader for the crucial role they played aftermath of the events took place on October 26, 2018. Sampanthan said Tamil people always regarded and respected the Constitution. “We always stood for principles and practices than engaging in cheap political gains,” he said. He further said the Constitutional Council was extremely careful in appointing people to higher offices and that was one of the reasons why the unconstitutional moves did not get approved by higher courts. Speaking on the United Nations Human Rights Council resolution, Sampanthan said, “Institutions such as the Office of the Missing Persons(OMP) and Office of Reparations and Truth and Reconciliation Commissions must actively function amongst people and should be in constant contact with the people to ascertain the truth.” He further said the government and certain politicians are trying to make this as a Sinhala - Tamil issue, though it is a fundamental human rights issue. Briefing on the new Constitution-making process, Sampanthan said there is enough work done on this matter for the past 30 years since the enactment of the 13th Amendment to the Constitution. But, there is no commitment and political will from some political leaders. “Tamil people may feel that they are always deceived. There is a reluctance on the part of the Sinhala leaders in doing the right thing. We are seeking a genuine power-sharing arrangement within a united, undivided and indivisible Sri Lanka. We have our own history and heritage, and what we are asking is nothing but our fundamental right,” he said. Sampanthan also requested the former UN envoy to highlight the Sri Lankan crisis internationally in order to ensure that the government of Sri Lanka fulfils its commitments to the international community.